When you think of psychotherapy, you probably imagine yourself sitting on a comfy couch alone with a compassionate professional with whom you share your innermost thoughts and feelings. But there’s another approach that’s just as effective for most of the problems that drive people to therapy—and it offers certain advantages that the more traditional one-on-one approach lacks. If you’re seeking professional help for depression or anxiety…a recent or long-ago trauma…drug or alcohol abuse…or troubled relationships, group therapy (often known simply as “group”) is worth considering. Just like individual therapy, there are different kinds of therapy groups. Some use methods such as cognitive behavioral therapy (CBT) to help participants change dysfunctional thoughts and behaviors, while interpersonal or psychodynamic groups promote insight into members’ feelings about themselves and others. They are not support groups, which are generally narrower in scope and bring together people who share a stressful situation like recent divorce, a traumatic life experience or a serious medical illness for mutual encouragement and the exchange of coping strategies. 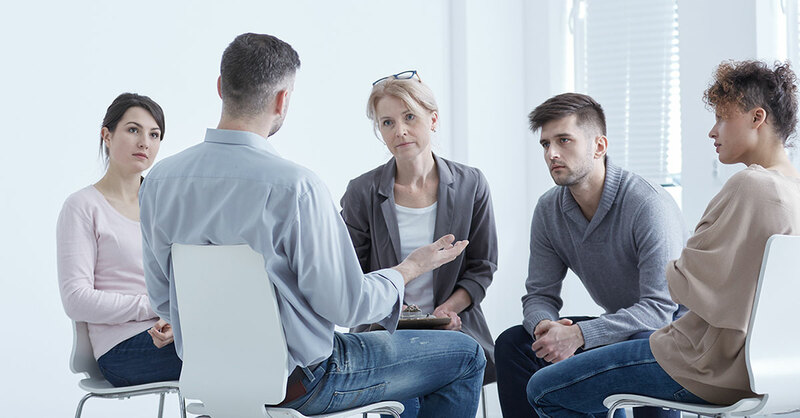 A psychotherapy group is designed to accomplish more—it will not only help a member get over a divorce, for example, but also help him/her to understand why the marriage failed and to work toward a healthier future relationship. Therapy groups ideally have five to 10 members and are led by a therapist specially trained in this kind of work. Most groups meet every week for an hour and a half to two hours. Some go on indefinitely with members joining and leaving or graduating over time, while others gather the same people for a set term of weeks or months. Key distinction: Group therapy isn’t just psychotherapy with the therapist’s attention divided multiple ways. The group becomes a social microcosm in which members talk about their actual impressions of one another in the group sessions—ideally with compassion and authenticity. For example, if one participant talks about her relationship difficulties, others in the group offer insights into the possible reasons—a lack of empathy, perhaps, or a tendency to devalue any relationship. It’s the therapist’s responsibility to set the ground rules (including confidentiality and mutual respect) and boundaries on what constitutes appropriate, helpful and effective feedback within the group. The group is a living laboratory offering the benefit of multiple perspectives and honest feedback. And because a trained therapist is on hand, it’s a safe space to try out new ways of behaving and relating. Group can be therapeutic for another important reason. We are naturally social creatures who need to feel that we belong and are valued. As loneliness continues to increase—with health risks that are comparable to smoking and obesity—group therapy offers an antidote. You get to know fellow members thoroughly, and they get to know you. The group confers a sense of belonging that may translate to the world at large. Additional benefit: Even though we generally seek therapy for help with our problems, group also offers the opportunity to help others—an empowering boost to self-esteem. Groups have proven to be as effective as individual therapy for most psychological problems and emotional disorders—and for some people, group offers even more benefits. Exception: In cases where there are intense concerns about privacy and trust—due, for example, to an early-life trauma—a person might start with individual therapy and then add or shift to group. Easy on the pocketbook: Insurance that covers individual therapy generally covers group, too. Because group costs, on average, about one-half as much as individual therapy, it is an appealing choice if you’re paying out of pocket. Initially, many people prefer individual to group therapy, often because groups—at work or growing up, for example—haven’t been kind to them. They fear belittling, exclusion or even bullying. But in a group run by a trained therapist, that won’t happen. The therapist will ensure a safe, respectful environment for all. And while members of a group are expected to participate actively, there’s no pressure for them to speak at every session or whenever called upon—or to disclose more about themselves than they want to. If you’re considering group therapy, referrals from health professionals can be helpful. Start by calling the therapist who leads the group. Find out what the group will be like and what kind of people will be in it, and make sure the therapist has specialized training in group work. Good resource: The American Group Psychotherapy Association (AGPA) maintains a directory of therapists who meet its standards, which include appropriate training. There are also more than 20 local group therapy associations across the country that are affiliated with AGPA. These are a great resource for finding a well-trained and qualified group therapist in your area. New opportunity: Groups that meet online via such digital media as Zoom or Skype. This can be especially helpful for people in isolated areas where mental health facilities are scarce or to bring together individuals isolated in their communities.